What Does an Assignment Editor Do? An assignment editor works at the assignment desk, which is the nerve center of any newsroom. This is where newsroom staff members monitor multiple sources for breaking news, including police and fire scanners. When possible news arises, the assignment editor works with reporters, photographers, producers, and other staff members to assign and develop story ideas. Small companies sometimes have one assignment editor who is responsible for organizing the assignment desk to operate around the clock. In larger newsrooms, there may be a team of assignment editors that take turns staffing the desk. It's up to the assignment editor to assign people to investigate and report on news stories. The assignment editor's day is sometimes spent shifting people and equipment around so that as many stories get covered as possible, with an eye out on how to handle breaking news coverage at any moment. When working in television, an assignment editor may also work with the tv producer to decide which crews will take live trucks or a helicopter to broadcast live during a newscast. Also, a TV news anchor who is reviewing scripts just before airtime will often turn to the assignment editor to confirm facts. Most assignment editors have the same types of degrees as other editors and journalists in a newsroom. Education: Most employers prefer candidates that have at least a bachelor’s degree in communications, journalism, or English. Experience: This is often key to getting this type of job, because experience is key to building a list of contacts and learning how to operate smoothly. Employers usually prefer candidates with a background in the type of media in which they specialize, whether it's television, digital, or print news. Training: Most training happens on the job. Aspiring assignment editors may want to find an internship position at a newsroom assignment desk. Editorial judgment: Assignment editors need to be able to quickly decide whether a story is newsworthy. And although they aren't usually writing the stories themselves, they need to know all of the components of a good news story to guide reporters on coverage. Interpersonal skills: Successful assignment editors form relationships with many contacts that can help bring a story together. For example, someone in this role at a local TV news station may have all the county sheriffs' home telephone numbers on speed-dial and be on a first-name basis with the current and previous mayors. Organizational skills: An assignment editor must be able to organize the logistics and track the details of several stories at a time and keep everything on schedule. Communication skills: An assignment editor must skillfully communicate with all of the staff involved in making news stories come together, including reporters, photographers, production teams, and executive staff. The U.S. Bureau of Labor Statistics projects that employment in this field will grow 6 percent through 2026, which is slightly slower than the overall employment growth of 7 percent for all occupations in the country. The BLS it doesn't offer separate data on the assignment editor subcategory. Most of this job is done in an office working under several tight deadlines at once. Those who thrive on pressure and get an adrenaline rush when something unexpected happens may be best suited for this occupation. 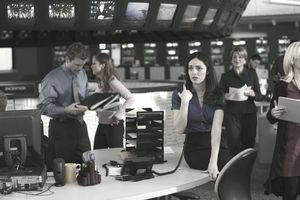 An assignment editor usually arrives in the newsroom earlier than the other managers to get a handle on what's happening that day to brief the newsroom. Most assignment editors work full time, and many work long hours, which include evenings and weekends. Making a list of contacts is the best place to start for a budding assignment editor. That involves making personal connections with people so that you can turn to them when you need information. The American Media Institute offers a list of professional associations you can join. Which one you choose may depend on your specialty or medium (websites or television, for instance). This will help you build your contact list and stay up to date on the latest tools and techniques in the industry. Search job sites that specialize in media careers, such as MediaBistro and iHire Broadcasting.